An announcement from Ringling Bros stating they will phase out elephant acts in 2018 started me reminiscing about the many tactics I used to underline circus animal cruelty over the years. It was right after a bear “act” when my colleague, Lea Ann Mallet and I surprised attendees on the Toronto Skydome stage by displaying a banner saying “Circuses Hurt Animals” in the early 90’s. 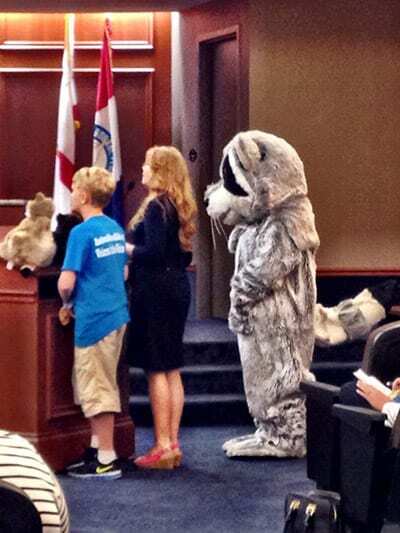 I spoke at the successful, now historic, Hollywood, Florida, exotic Animal display ban city council meeting in 1990, the first of its kind in the U.S. More recently as Animal Hero Kids founder I urged Melbourne City councilors to enact a wild animal display ban after a sad incident of a lion being displayed in a downtown bar. Two of the Animal Hero Kids featured in the new book, “Animal Hero Kids, Voices for the Voiceless” helped to ban bull hooks- sharp weapons resembling fireplace pokers that are routinely used to beat elephants in order to get them to perform cruel tricks- and electroshock prods being used on elephants in the Florida cities of Margate and Miramar. Los Angeles; Oakland, California; also passed similar legislation in the last year. Ringling stated “[a] lot of people aren’t comfortable with us touring with our elephants” as a reason for today’s announcement. This is a great first step, however, if Ringling is serious about its decision, then the circus needs to end its exploitation of elephants now. “Three years is too long for a mother elephant separated from her calf. It’s too long for a baby elephant beaten with a bull hook. It’s too long for an animal who would roam up to 30 miles a day in the wild but who is instead kept in shackles.” said Peta’s undercover investigators, and they are correct. Here is one instance of a pregnant elephant enslaved by Ringling Bros on the road who gave birth being bullied by her captors that underlines the need for quick rescue action. How many more incidents of abuse, chaining, beating…will happen in three years? How many instances of animal abuse are happening right now away from the cameras? My point is, simply, this, we will not reduce the levels of education, protest, and actions for captive elephants on the heels of this announcement until all elephants are free from chains, beating, bullies and harassment. We are encouraged, yet more determined to get the word out about how the lives these elephants lead are miserable shadows of their wild natural life. The book is a part of Power Kind, Animal Hero Kids’ complimentary humane education school program which includes resource kits gifted to school libraries. Power Kind with Animal Hero Kids to prevent animal cruelty. Buy a book, fund kind by clicking here.